Dominick Reyes Earns A Split Decision Win Over Volkan Oezdemir In A Great Stand-Up Affair! UFC (Ultimate Fighting Championship) is headed across the Atlantic Ocean with the most powerful ESPN+ fight card. UFC on ESPN+ 5 is taking place tonight (Saturday, March 16, 2019) inside O2 Arena in London, England. Welcome to the 205-pound match between WKN Valhalla: Battle of the Vikings Tournament winner Volkan “No Time” Oezdemir and the undefeated prospect Dominick “Dominator” Reyes. The referee in charge for this contest is Leon Roberts. Let the war begin! Reyes attacks with a leg kick. High kick follows Volkan answers with a big right cross. Great low kick and it seems Volkan is off-balance, but he is back in his guard quickly. A great right-hand combination, and now he hits very close to the rival’s groin as he spins. Yet, the kick is legal. Double right hand and Volkan knocks Reyes down with a low kick, what a shin strike!!! Reyes stands up, creates some space with an elbow. Counter left Volkan, and now Reyes is against the fence. Reyes lands a knee, and they separate. What a stand-up affair, this is great to watch. Counter left punch, and now Volkan grabs the rival’s leg, what a technique, great defense. Right hand to the body, I’d say 10-9 Volkan. Volkan counters a leg kick with a brutal hand, what a reaction time. Wow, now Swiss connects, delivers few punches in a row. Leg kick Reyes. Reyes feints a kick, lands a jab to the body. Reyes shoots in, but very bad single-leg takedown attempt, Volkan sprawls and defends, but he also shoots in. Final result – no takedown. Body kick from Reyes caught, what a reaction by Oezdemir, this guy has superb reflexes. Straight right Volkan, now good knee and excellent right hand. Leg kick Reyes, but Volkan lands a big right hand. Straight left, but Oezdemir delivers a leg kick. Volkan threatens with a headlock but it was only an attempt. Reyes misses with strikes, defends a takedown. I’d say again 10-9 Oezdemir. Oezdemir shoots in. Reyes low kicks, but gets taken down. Reyes sets himself free. Right-hand leg kicks Oezdemir, Reyes misses with combos. Uppercut missed, but straight left breaks the guard. Lead right Volkan Oezdemir, a head kick is blocked, great stand-up game on both sides. Reyes is on the fence, good knee. Left hand to the body Dominick. Oezdemir looks fatigued, and Reyes delivers a great strike. Now takedown and a body shot. Fighters throwing strikes in the center of the Octagon. Good attack by Oezdemir. Reyes ends the round with a body strike. 10-9 Reyes. 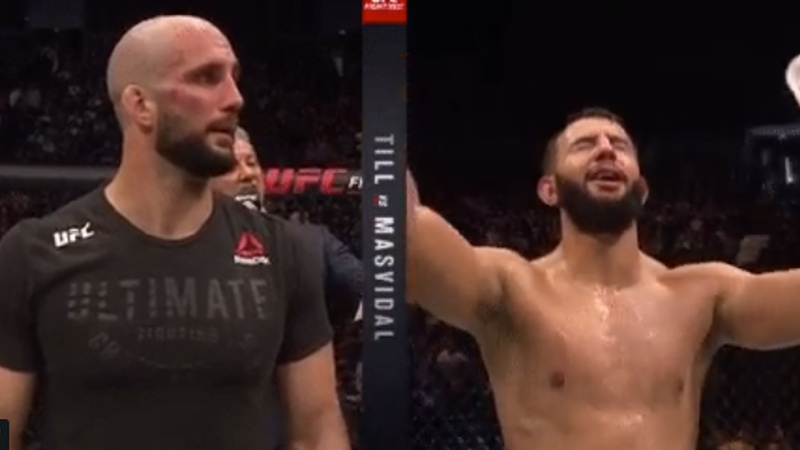 Dominick Reyes improves his score to 11-0 MMA, 5-0 UFC, Volkan Oezdemir drops to 15-4 MMA, 3-3 UFC.